Each spring brings the promise of warmer days and the transformation of desaturated landscapes into a vivid green. Thabang Sibiya grew up anticipating these changes and appreciating the wealth of natural splendour. Today, she’s committing her time to ensuring others continue to enjoy and experience the outdoors. Because in the future, the trees and plants that bring her joy may cease to exist – a direct result of human interference. 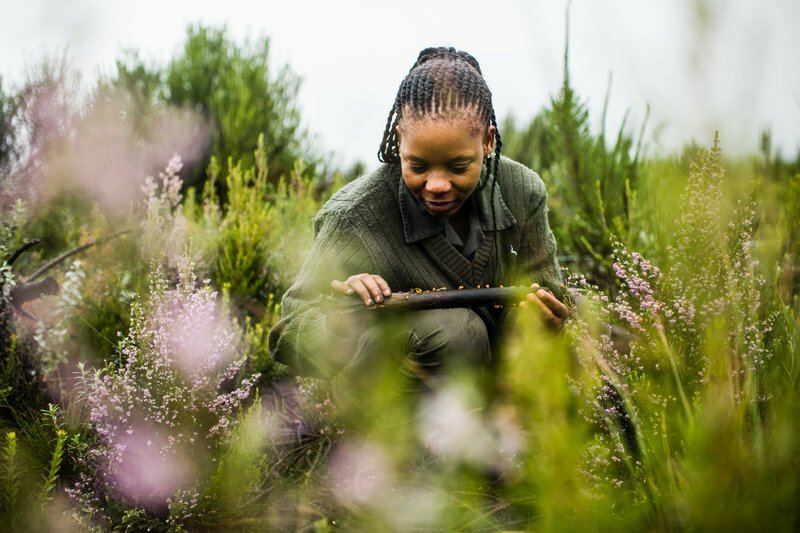 Sibiya’s interest in conservation developed as she noticed that velds of indigenous vegetation were disappearing over the years. “Seeing this made me sad because I knew that my nephews would not see the same green that I saw when I was growing up,” Sibiya says. Urged to act, she studied Environmental Science and became a restoration ecologist for SanParks. Sibiya restores fynbos, addresses disturbances to forests, and handles invasive plant species in the Garden Route area. Her work seeks to teach people how to care for local flora, especially after disasters such as the 2017 Knysna fires. Sibiya draws inspiration not just from nature, but from her peers as well. “The women who came before me in science have paved the way for young scientists like myself,” Sibiya says. Following in their footsteps of conservation is important to the ecologist. Though she’s committed, Sibiya alone can’t change everything. We all need to play our part. “The everyday person should notice that the environment is in crisis,” Sibiya says. “Their activities will eventually determine how well the environment provides for them.” Because of women in the field like Sibiya, we can ensure that the only marks we leave on the landscape are from our efforts to protect nature, not destroy it. “To me the most beautiful thing is seeing a vast terrain of green and people making sure it stays that way,” Sibiya says.